3 Years After Sandy: Where am I Now? Superstorm Sandy changed my life – that is an understatement. The memories of the tears in the eyes of my tough watermen friends and the sense of panic I felt during the 16 hour work days we put in during the rescue and cleanup period are beginning to fade to the point where they do not disturb my sleep anymore. As I reflect on the past events and current status at the 3 year anniversary today it has become increasingly clear that the most damaging and long-lasting effects were not caused by the storm itself but by the human reactions after the storm. One way to look at the impact is to break the storm’s effects on many of life’s individual components. It does result in quite a long article but the after-affects of the storm are so widespread that it seems impossible to do the topic justice in a shorter summation. Insurance – The cabin I called home is “totaled” but my flood insurance claim and homeowners claims were denied. I lost the appeal of the homeowners claim (no coverage for wind damage). I hired an attorney to reopen the flood claim but I do not have any insight into how this effort will work out. It feels like being punched in the gut after paying these insurance premiums for so many years, listening to the advice of my insurance advisers, and then having them all turn their backs in this time of disaster. I now have a bad attitude about the insurance industry – that is also an understatement. Financial – The day before Sandy hit in 2012 my bills were paid, I had a little money in the bank, a high credit score, a modest retirement account and cash value life insurance policy and substantial lines of available credit that I thought would sustain me through rough spots in business. In short, I was a normal middle-income guy with a normal small business struggling to balance many business challenges, pay for health care and help put kids though college. Today I have exhausted all of my financial resources, am heavily in debt, have defaulted on some borrowing accounts and face tax lien foreclosure. My income for 2015 is perhaps half of what it was in 2012 before Sandy. Sandy did not just affect my NJ shore business. It also affected my Pennsylvania-based accounting business. There are only so many hours in the week and additional necessary time demands on recovery efforts took away from my other business. Real estate – Properties in my community are worth about a third of what they were a decade ago. That is due mostly to sea level rise and not to Sandy but certainly Sandy hastened the crash of property values. This is a big problem for me since most of my remaining net worth is in real estate. Meanwhile property taxes continue to rise at an unprecedented rate. The combined impact of falling values and rising taxes means that I pay about 15% of property value in real estate taxes every year. As far as I can tell, that property tax rate as a percentage of property value is among the highest in the country! Home and relocation – The concept of “home” has always been central to my personal identity. Perhaps it is a Jewish/Catholic values thing. But I get emotional thinking of the loss of our family home where I raised a family and planned to eventually retire to live the rest of my life. But I see no realistic possibility of rebuilding a comfortable home at Money Island in today’s legal and regulatory environment. The modest cabin we’ve loved and called “home” for most of our lives is crooked, leaking and crippled and must be torn down. Coincidentally this week the State of New Jersey Blue Acres program officially opened the discussion of buying the property. I suspect that I will eventually feel pressured to sell at less than I paid just to cut my losses knowing that there is no other likely buyer. I am worried that the amount of post-Sandy debt now puts me in a negative equity position on the house. If the state makes a low offer on the property then I fear that my creditors who are on the warpath will not accept a lower settlement amount to resolve this mess. In any event, that leaves me with $0 to find a new home. Business – The marina, commercial docks and seafood businesses at Money Island are rebuilt better and stronger than ever before. We’ve learned a lot about hurricane-resistant construction of modular structures, dune building, living shoreline restoration and improved methods of building docks and piers. I believe that we can now withstand a storm of sustained 85 mph winds and flooding up to 6 feet above mean high tide without substantial damage. Four elevated storm-resistant recycling centers replace the old steel trash dumpsters that spilled their contents and washed away during Sandy. Solar lighting replaces the destroyed electric lighting on the docks and outbuildings. The well and pump house are completely rebuilt under modern building code requirements, as well as the fuel system. All of our new structures are elevated and movable since we were not able to get any building permits for reconstruction. Much of the business and equipment storage is contained in mobile trailers that can be evacuated to an offshore location if necessary. I’ve put a lot of effort into landscaping and small details to make sure that the property looks good and is more storm-proof than in the past. Visitors complement us on how great the place looks now. We are proud to be a primary fuel vendor for the Coast Guard and NJ government agencies and to host boats operated by Rutgers University and some of the largest commercial oyster companies and watermen. Unfortunately many recreational boating customers have not returned to the marina since the storm. The state says that recreational boat registrations are down about 40% in recent years. As a result, our financial future is still in jeopardy. The business has gross revenue of only about 1/2 of the amount collected a decade ago. Yet all the operating expenses are higher today. We have been working on a sustainability plan but it is not yet complete to the point where I can say that we have a viable business plan. Most significant, I have not been able to establish necessary lines of credit or attract additional investors to take us to the next level of post-Sandy transformation to a sustainable aquaculture and eco-tourism based business model. We speak candidly with workers, contractors, customers and government about the severity of this business climate. We will be open in 2016 but the future beyond next year is uncertain. Disaster relief – I listened to Governor Christie when he went on TV and effectively said ‘Go ahead and make necessary repairs. Get your businesses open again. We’ll worry about the paperwork later’. Silly me. I’m paying dearly for listening to that advice. Everyone, including the aid officers agrees that “disaster relief was a disaster”. I’ve lost track of the number of aid applications and tremendous number of hours providing required documentation. I joke that if I took a side job at $10 per hour I might be better off financially compared to the return on time invested in disaster relief applications. A few months ago NOAA, a federal agency, came through with a grant of $8400 to keep our commercial fishery business from closing. I was especially disappointed that our SBA loan applications were denied. (I am reminded of the old joke that a banker is a person who offers you an umbrella on a sunny day and then demands it back when it starts raining). Government prosecutions – In the 27 years before Sandy I did not face a single government complaint. This includes federal, state, county and local government entities. Since Sandy the NJDEP has issued multiple property liens for my tidelands lease violations, Downe Township attempted tax lien foreclosure, my state building permits were all declined, the state building inspector issued fines for making post-storm repairs without a building permit, Cumberland County Health Department issued Notices of Violation for pre-existing water and septic violations, DEP issued multiple Notices of Violation for a range of pre-existing conditions, NJDEP declined my waterfront development application and then declined my application for exemption for waterfront development, the NJ Department of Community Affairs prosecuted me for late payment of a business permit (with a 100% penalty) then most recently Downe Township attempted to prosecute me for lack of a Certificate of Occupancy. I’m not saying that the government’s individual actions were without merit. I am saying that it is ridiculous to presume that any property owner could deal with this onslaught of new government demands in a “down and out” status left by the wake of Sandy. Certainly we all want to live in a society defined by compliance with government standards. But it is unconscionable to prosecute property owners who are doing their best under these extreme circumstances. I emphasize that most of these problems existed for decades before I even came onto the scene and it is unreasonable to demand that I fix them all immediately. Even under the best possible outcome, I will have wasted a substantial amount of time and money when these precious resources were badly needed elsewhere during Sandy recovery. Scams – The environment of chaos surrounding a disaster seems to be a perfect environment for those who thrive on crime. I was not as diligent as I would normally have been if I weren’t working 14 hour days with little sleep. I was caught in a complex scam that I should have otherwise been able to avoid. It may take years and a lot of money to resolve. This is wasted time and money that is desperately needed to help other areas of recovery. Marriage and family – Marriage, for me, has never been easy. Since Sandy, marriage has been on life support. I’ve missed most family activities in the last three years. In fact in the first 14 months after the storm I took only two days off. Otherwise it was 14 hour/7 day work weeks focused on rebuilding the business. I’m working on it, but as I said, I’m not an expert on the topic of healthy personal relationships. Friends and community – I still get emotional when I think of the friends I used to see daily – those that were part of my comfortable daily routine – but haven’t been seen since Sandy. I can see that the incidence of mental illness has increased in my community. The level of hostility among neighbors is increased, families are breaking up at a faster pace and the anti-government attitudes I observe are at near revolt level. I don’t share these hostile feelings; frankly I am too wrapped up in just keeping my life together. Mental and physical health – They say stress kills. I think about this often now. I’ve gained weight. I get less sleep due to stress and probably also because the house is not so physically conducive to restful sleep anymore. I exercise less often. I rarely get to participate in the hobbies and activities I used to enjoy before Sandy. I am aware of the need to return to a balanced life but the ongoing demands and daily treats indicate that it may take years before I can relive this stress. Online discussions of “Post Sandy Distress Order” make me realize that I’m not the only one. Media coverage – I have often been in the news; it’s part of my shtick. One of my early articles (long before the storm) about the economic effect of sea level rise predicted the financial collapse of local government and triggered a death threat from a public official. The number of interviews and articles since Sandy has increased and I don’t even keep track of them anymore. Unfortunately one by Newsworks this year positioned my strategic retreat endorsement against my neighbors’ “no retreat” for the sake of sensationalism. We don’t need that extra tension in the community. Environmental management – Sandy served as an open door for half-baked proposals from environmental organizations to spend vast amount of money on unproven projects in our community. We spent a lot of money trucking sand here for the horseshoe crabs while the residents were still homeless. Much of that sand has already washed away from the beaches and now clogs our two inlets. We are now building oyster castles in the inter-tidal surf that cannot possibly sustain living oysters through a Delaware Bay winter freeze. When I speak to the scientists who really know better, they give long-winded responses that boils down to “that’s where we found the funding available”. As the Treasurer for an environmental nonprofit organization it turns my stomach to hear such comments but I force myself to ignore it and say to myself for reassurance “these are the good guys”. Sustainability – I can see that Sandy hastened the pace of New Jersey’s so-called “millionaire drain”. Too many of the best and brightest business people have already written our community off. I’ve been working on a business sustainability plan for more than two years with a lot of great community and professional input. But the bottom line is that we still do not have a complete business plan that I can bring to an outside investor and say “this will work”. Without a complete viable plan for sustainability we are doomed. Politics – I was not involved in politics before Sandy except for occasional financial support of local candidates. After Sandy I resisted a strong-armed request for a political “contribution” to ease the recovery permit process and now we continue to pay the price for my defiance. 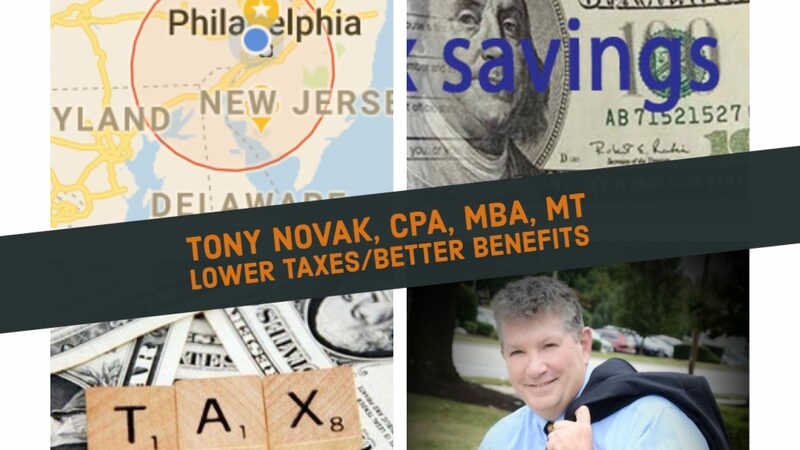 Eventually members of the NJCPA and others helped me assemble a “brain trust” to advise the business and we concluded that the only viable path to sustainability of the business was though political channels. I adopted a political response strategy and it has been relatively effective. I won’t embarrass the political figures who have helped me (considering the nature of this rant). I applied to the Governor’s office for appointment as a volunteer citizen representative on an advisory task force that might possibly help steer the future of our community but our State Senator suggests that these appointments are backlogged while the Governor campaigns for the Presidency. So where am I now? I feel that my future is largely in the hands of government and the legal system. This is not to say that I do not recognize the fact that my own actions largely determine my future. I think about the realm of possibility: 1) things that matter, 2) things I can control, and 3) the overlapping area of things that I should focus on. I just can’t seem to make a reasonable prediction of what will happen to my business and my community in the years ahead. It remains difficult to plan a fulfilling life under these circumstances. 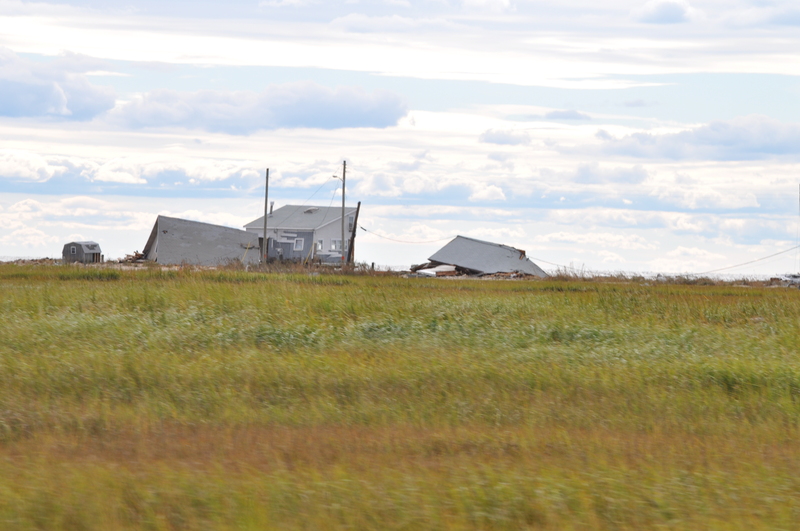 The physical impact of the storm is still visible in the vacant lots in our community. But the combined effects of piled storm recovery debt and government reactions actually seem much more real and tangible to me. These threats could put me out of business and, if we are forced to sell out to settle the debts, might eventually have the effect of completely obliterating our small community from the map. Bankruptcy and divorce remain constant risks. I am coping but just barely. I feel angry knowing that after having successfully battled against nature and rebuilt a business, I now have face the more powerful and more sinister efforts of humans who now attempt to pull us back under using a maze of legal maneuvers, building code compliance measures, taxes, and enforcement of arbitrary and often nonsensical environmental agendas. I know that we won’t win the battle if government is truly intent on destroying us. The bottom line is that for now at the 3 year mark I am still in limbo. I am looking for indication of direction for my future here in New Jersey. I have psychologically prepared myself for the possibility that I may need to pack my belongings, drive away back to Pennsylvania, and never look back to the bay shore that I love. I can only hope that by the 4th Sandy anniversary I will have something more substantive to write. Thanks to all my NJ neighbors who offered comments on the writing of this post and offered help with proofreading. I feel especially empowered by those who said that I am sharing their own personal story as well but that they would not feel as capable of summarizing their experience in writing. 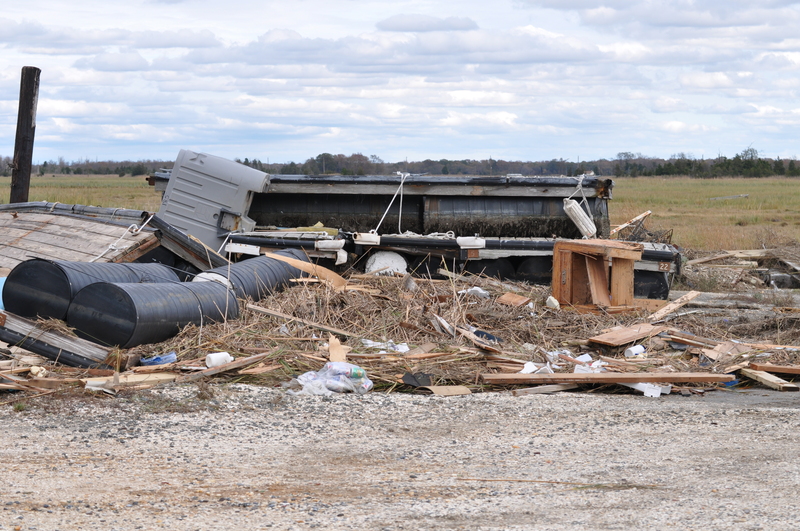 The photos are actually a neighbor’s business at Bay Point where we helped with cleanup about a week after the storm. Apparently nobody thought about taking pictures at my community of Money Island during the chaos. Tony my heart broke reading this letter…how true that friends that were there all along are suddenly gone…this also includes family. I believe if you haven’t been through it…it doesn’t matter so much…and unless you’ve been through it you have no idea what any one of us has been through.. I’m fortunate…my home is rebuilt…something I had to do on my own…since my husband died 7yrs ago…so here I am…a woman who hardly knows the difference between a hammer and screwdriver trying to figure out all the rules and regulations…have a good friend who helped me rebuild….but dealing with all the paperwork alone can kill you…fight for every dime…never missing a insurance payment…like we could if we wanted to…I was awarded the full grant sine according to the state I misused my funds after I was done rebuilding…silly me buying my kids clothes…blankets…furniture…and other useless items…I’ve been fighting since 2013 for my grant to be raised to the full 150,000….no such luck…finally signed a contract to raise…and of course…now more paperwork and the utility companies controlling when to shut everything off..so more fighting…And still I ask myself…where is Gov Christie and the money people where promised to “Restore the Shore” ?…..I can’t seem to find either one…I wish you the best…and hope eventually you get home to a home you love again.. Thank you Cathy, best wishes to you and your family also. One emotion I also have is quilt….I feel quilty that my home is rebuilt and so many aren’t…can’t explain it…but it’s there…Thank you for putting into words what so many of us feel,but couldn’t express.I also hope the 4th yr anniversary has better results. Can only hope and pray,and get tired of doing that sometimes. Tony, I honestly have not seen a more concise description of my personal story, I have experienced every single thing that you described. I could never have been able to so eloquently articulate everything that has happened to my family & I after the last 3 years. Even though it is a heartbreaking story, thank you so much for putting pen to paper and shedding light on the ridiculousness and completely unnecessary suffering we have had no choice but to endure. The storm was the easiest part of all of this……..Fighting the system has been a nightmare I won’t ever forget. My 2 year old has never been able to live in her own home. I continue to fight and will never give up my “home” as you stated…….”home” means a great deal. Thanks Andrew. I feel empowered by the comments of neighbors like you who that say their story is the same but that they would not feel as comfortable expressing the experience in written form.